This application provides a graphical interface for the WordNet semantic network and is very similar to the X Window System client that is part of the WordNet distribution; except it looks much nicer on Mac OS X! 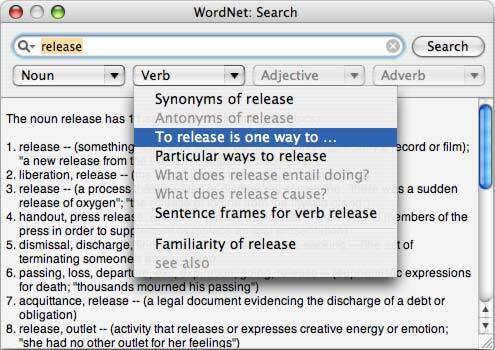 Note that it does not query any of the online versions of WordNet but needs a local copy of the dictionary files. Please note that version 5 will run on Panther only. Users of Mac OS X below version 10.3 will have to use version 4. Version 4 adds a find panel to aid in refining your search as well as access to the built-in spell checker. Make sure to select WordNet! Note, that you can't use the version 1.7 dictionary files from the WordNet project! We're not even planning on upgrading to that version as we don't see any benefit in our case. So, when you're using WordNet.app you have to use the version 1.6 files. The version 1.6 database files can be downloaded using the link above. After downloading & extracting the package you don't need to build the unix version as we've integrated the client libraries in the application already. It is sufficient to copy the 'dict' directory to /Library/WordNet, or any other place you like, and tell the application about it. That's all!